I have the best pasta dish for you today! No, seriously, it really is the best. It takes just 15 minutes to throw together and it tastes amazing. It’s Mexican, it’s cheesy, it’s fast, and you quite likely have everything you need to make it already. Oh, and everyone will love it. Or, at the very least, everyone here loves it. So I’m projecting that sentiment onto the entire world (or at least the few people that read this!) and proclaiming that everyone will love it. What’s not to love? Well, besides these awful photos that is. Please excuse them. I tried twice, they were still awful. Just believe me when I say that it’s a whole lot better than it looks. Evidently baked pasta is hard to take pictures of. Oh well. I’ve been making this pasta dish for about 8 years now. It’s been modified a fair bit from the first time I made it based on what we like. So it’s fairly adaptable if you want to add more beans, less corn, more cheese. It’ll still turn out amazing. Maybe throw in some more veggies. I’ve done that on occasion. But generally I’m making this pasta dish when I haven’t bothered to meal plan and don’t know what to make. It’s delicious, everyone will eat it, and I usually have everything I need to make it. And it takes so little time to whip up. Like I said, what’s not to love?! 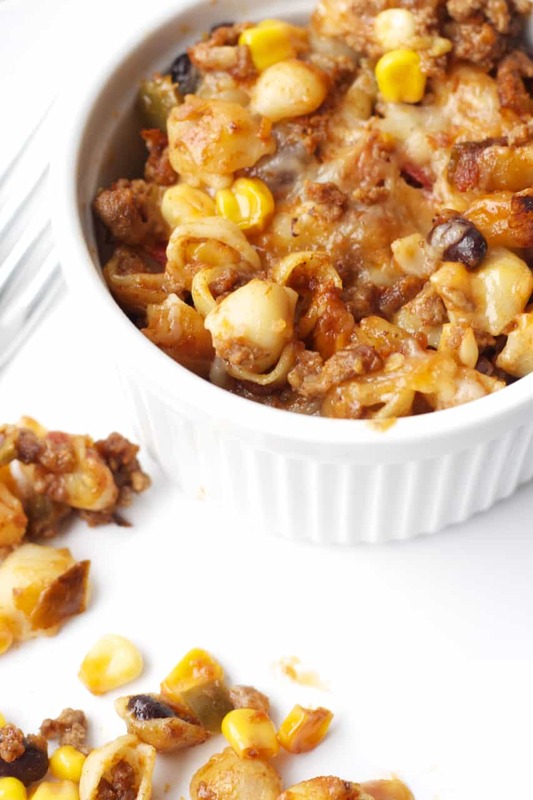 Fast, easy and tasty Mexican baked pasta. So good. In a large pot of boiling, salted water, cook the pasta until al dente (don’t overcook or it will become mushy during baking). Drain well. In a large skillet, over medium heat, cook the beef until it is no longer pink, about 5 minutes, and drain the grease. Add the salsa, corn kernels, and beans and stir to combine. Cook, stirring for another 3-5 minutes to blend the flavours. Add to the pasta and stir to combine. Spoon half of the pasta mixture into a 9x13 inch baking dish. Sprinkle half of the cheese over top. Add the rest of the pasta mixture in an even layer and cover with the rest of the cheese. Bake for 30-35 minutes until hot and bubbling. Alternatively you can prepare the dish, then cover and refrigerate until ready to bake. You will need to add 5-10 minutes to the baking time. This pasta dish also freezes well. Prepare the dish, then cover well and freeze for up to 3 months. Thaw before baking. Hahaha, if it was too spicy for you, just use a milder salsa next time. All the spice comes from the salsa so you can make it as spicy as you want. We would actually like it spicier but the kids wouldn't eat it then! :) Glad you liked it! This dish was so yummy and I loved how I could clean the dishes while it baked in the oven:) My hubby and I polished it off in two meals and the leftovers were just as good as the first meal!! Will definitely make this one over and over again. oh my gawd, these photos are NOT awful!!! 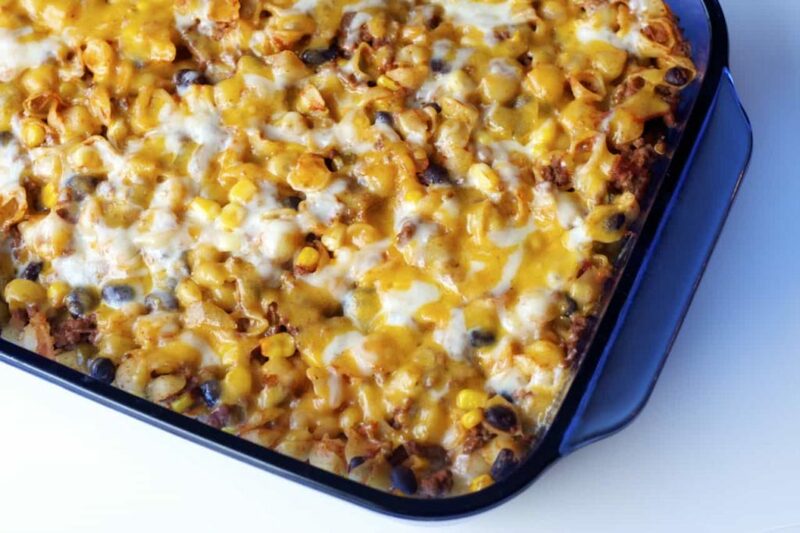 Dude, this Mexican Baked Pasta looks pretty damn fabulous if you ask me!! love!! Hahaha, maybe I just stared at them too long?! Whatever. Thanks so much Alice! This looks great. I love the idea of baking in individual baking dishes. 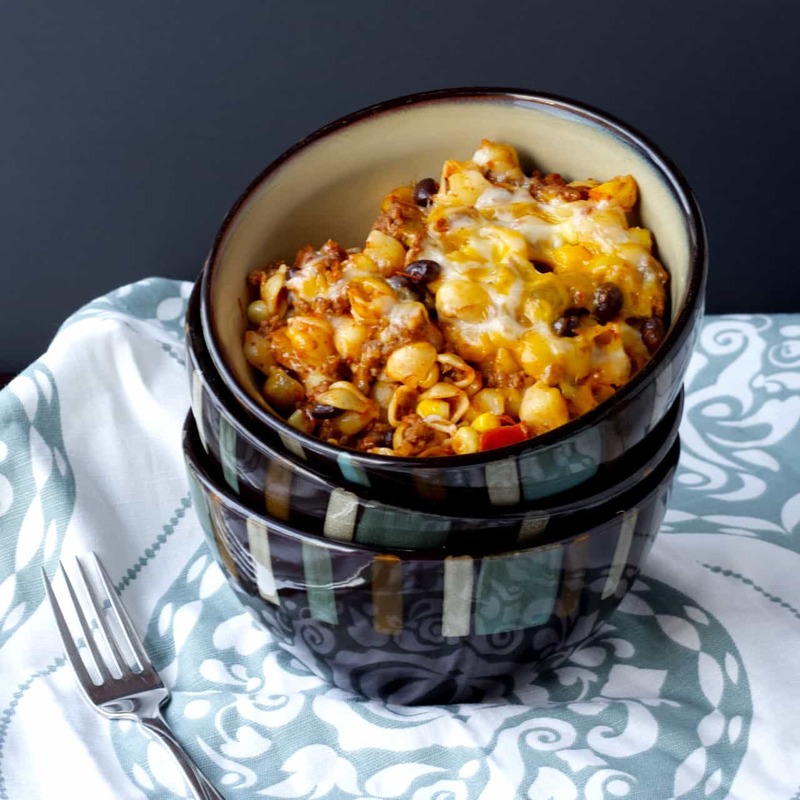 I've got a similar recipe on my blog, but I love that you've added corn and black beans to yours! Isn't it so tasty to eat mexican food with pasta?! That it is! So good. Thanks Aimee! This pasta looks deeelicious! Love the Mexican flavors in here! Looks like the ultimate comfort dish! Totally is, mexican, cheese and pasta, what more do you need?! Thanks Kelly! Thanks Medha! Baked pasta is really such a great comfort food isn't it?! Haha, thanks Hannah! I'm sure a vegan variety would be great too! I'm sending this to my sister—this has all her favorite things! I don't know what you're taking about -- this looks SO good! I mean, pasta and cheese. I'm in! You know I love me some mexican!! This pasta looks awesomeeee. And I love that I usually have pretty much everything on hand! Thanks Ashley! That's exactly what I love about this - mexican flavours and I always have what I need for it! Thanks so much Mira! And thanks for pinning! This has my son's name written all over it! I can't wait to make it when he's home! And your pictures look great, my friend! I'm hungry...they worked!! Haha, thanks Annie! Hope he likes it! This pasta looks amazing, Stacey! I love that you combined two of my favorite foods into one dish. And my husband would love this too, as any Mexican type food is our favorite! Looks delish! Mexican is our favourite too, so good! It's always my go to when I don't know what to make! Thanks Gayle! this is definitely my kind of comfort food. love this! The photos look fine Stacey :) brown food is little difficult to shoot but you did a good job! The pasta looks delish, I have never made a baked pasta dish but when I was in Scotland..one of my friends there used to make this amazing baked pesto pasta..it was so good and after you post I think I need to make it asap! Yes do, and then post it! Baked pesto pasta sounds lovely! And thank you - it is tough to shoot isn't it?! Oh I like these photos! They're beautiful! I think you're safe to project those feelings onto the world.... the world WILL love this. Super easy, cheesy, and flavorful? Sold! Aw thanks Sarah, but they took a lot more work in the editing department than usual! Ah well, haven't taken many of main dish stuff yet, it's way harder than cookies and muffins, maybe since I'm trying to take pics of the leftovers the next morning since the light is non-existant at suppertime?! Can't wait for summertime light!! Wow Stacey this looks amazing! Love me some pasta especially when its got Mexican flavor. This looks super easy too! Great for a busy weeknight! Thanks Kelley! Those are the main reasons I love it - so quick and easy on busy nights, and anything Mexican is just plain awesome! This looks easy and delish! I make baked ziti a lot for my kids, so I will sub in this recipe next time to mix it up a bit! Thanks Kimberly! Hope they like it!